Here at Who What Wear UK, we want to take all the stress out of shopping, and to help us do just that, we're launching a new series, We Try Before You Buy, where we'll be road-testing new trends, fresh labels, the latest drops and key buys. This season there is one trend that keeps selling out all over the high street: rainbow stripes. Garish multicolour sequins can run the risk of looking a little clownish, and so to prove that this is a trend that you can in fact wear every single day of the week, we tasked fashion influencer Monikh Dale to style the idea in five very different ways. Almost every item you can think of has received the rainbow treatment this winter, from tracksuit bottoms to denim jackets, and so Monikh shows how you can wear rainbows for brunch, your Christmas party and everything in-between. Keep scrolling to see how Monikh has styled this rainbow print, and shop the key pieces below. Style Notes: This striped wrap tuxedo dress from Zara is enough of a statement on its own, so Monikh kept the rest to a minimum pairing it with black suede over-the-knee Kurt Geiger boots. Style Notes: This striped Gap jumper has been doing the rounds on Instagram, and Monikh played with the pink colours by pairing it with dusty pink cords by Isabel Marant. Style Notes: If you want something a little subtler than a rainbow-sequin dress; then opt for Topshop's black tracksuit bottoms with rainbow stripes down each leg. Monikh made it look low key by wearing it with white trainers, a white T-shirt and an oversized khaki jacket. Style Notes: London Fashion Week label Ashish has been one of the designers leading the rainbow craze, with wildly OTT sequin pieces. 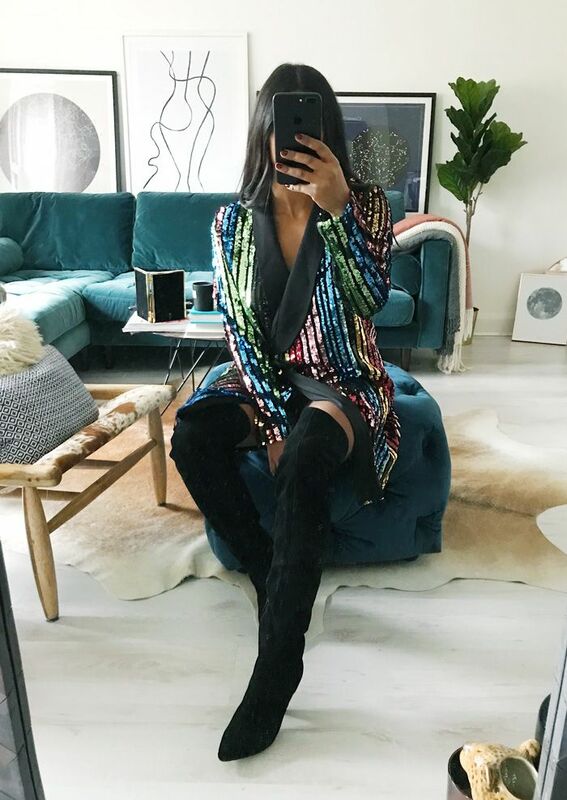 You might think that a colourful sequin jacket is a party piece, but Monikh makes it day appropriate by wearing it with jeans, a T-shirt and chunky patent boots. Style Notes: This Gap white jumper is a subtle nod to the trend, as it just has one rainbow stripe across the chest. Add white pumps and jeans, and you have the perfect brunch look. Next up, see our edit of the best rainbow striped jumpers to buy now.